The new, healthy, natural and organic mattress you purchased is about to be delivered! The question is, what are you going to do with your tired, old mattress and box spring? If it’s not going to be used in a guest room, other options to explore include using our white glove removal service, sending it to the landfill, recycling, or finding a new owner. White Glove Mattress Removal: White Glove is a type of delivery service we offer in which the delivery agent will set up your new mattress for you. An option that can be added to White Glove delivery is a “mattress removal” service so you don’t have to worry about getting the mattress out of your bedroom. With this service, the delivery agent will deliver your new mattress and they will remove and dispose of your old mattress for you. This option does require a fee, sometimes as much as $300.00, but it can be a good option for those who are physically unable to move a mattress on their own, or are unable to find help. The Landfill: This may not be the cheapest or most sustainable option available, but it should be available just about everywhere. If your vehicle is large enough, you can use it to take your old mattress to the landfill or dump, but if you are unable to transport large furniture items to the landfill you will need to call someone to collect it. You have a couple of options. Many sanitation companies have the ability to schedule a large item pick up at the curb, similar to your trash pickup. Call your current sanitation company or use the internet to research local options specific to your area. The other option to get your mattress picked up is by a private company, such as 1800gotjunk.com. You can do an internet search for “junk removal” and your city. 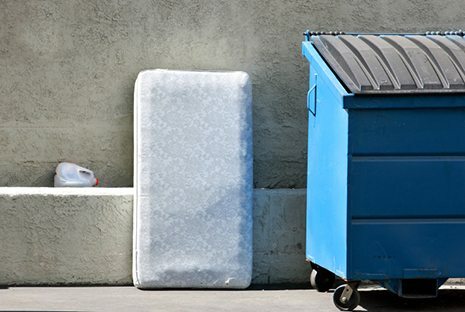 Recycle: Many cities have organizations with the ability to recycle old mattresses for a fee, which can sometimes be cheaper than using the landfill. Some of the raw materials in the mattress such as the metal springs can be recycled and even the foam can be recycled to make carpet padding. Mattress recycling might be more available in bigger cities than small towns but it is worth looking into as an option. In Denver, we suggest Spring Back Colorado and outside of Denver we suggest doing an internet search for “mattress recycling” and the name of your city. Find it a new owner: Craigslist.com is an option if you are interested in selling or giving your mattress to somebody else. We’ve had many customers find this to be an easy and sustainable option! This option is great because it will allow someone else to benefit from a mattress that may not be able to afford a new one and also keeps the mattress out of the landfill. We recommend that you only use Craigslist as an option if you have had positive experience with the site in the past and feel comfortable with the process. You can even put your mattress on your curb and advertise it on Craigslist as a free item. In this situation you may never need to interact with the new owner. There are many options for getting rid of your old mattress, it’s just a matter of which one is the most convenient, or cost-effective for you. Now make room for your new, healthy, natural and organic mattress and sleep easy!